The Osugi michinoeki is a two-story blue building with many banners flying outside advertising many different foods and drinks. Nearby stands a map with a picture of the late Misora Hibari (a very popular Japanese enka singer) along with a monument and explanation of “michinoeki”. Then there is a very big tree which is the famous cedar in Japan. The reason why there are connections between the big cedar and Misora Hibari is that; there were some points related each other. The following story is a real story which happened in Otoyo town. In 28th April, 1947, Misora Hibari was touring as a part of working with her mother all over Japan . Then the bus Misora Hibari got into collided with an oncoming car and fell off from the road in Otoyo town. And she was carried to Dr. Murakami Takashi of Uemura hospital because she lost consciousness due to excessive bleeding, and had a narrow escape from death. After medical treatment of one month and half a month, she recovered from an injury. Then she came to Yasaka-shrine (the place where the big cedar was built) for appreciation for people who had took care of Hibari when she had got injured, with her mother and prayed to the big cedar that she could be the best singer in Japan. 5 years later, when she was 14 years old, she performed publicly in Kochi city and she also worshiped this tree again. For these facts, a portrait of a deceased Misora Hibari’s tombstone and a song monument were built by people in Otoyo-town. Also, now, Hibari hall where people can have a meal was built at the spot Misora Hibari fell down. It is the spot where about 1 kilometer from the big cedar was. 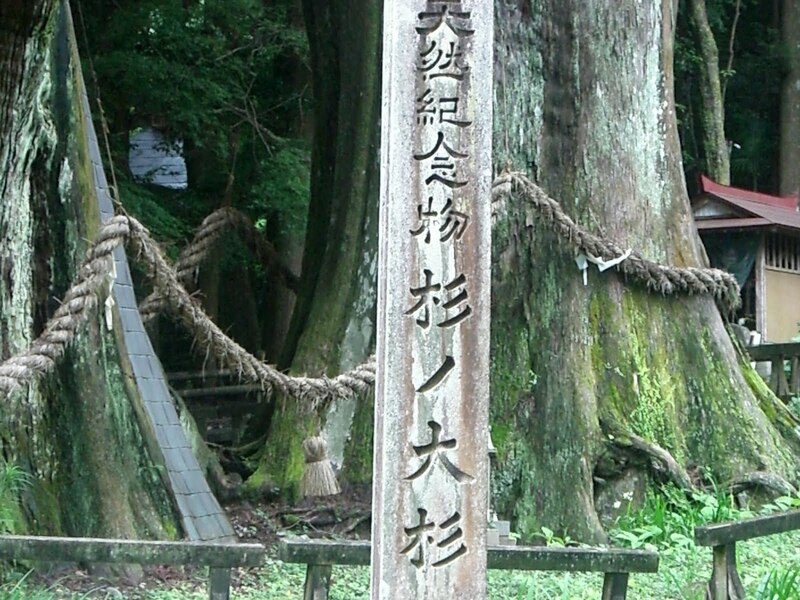 Therefore, Misora Hibari was related to the big cedar in Otoyo town very much. Also, there are a lot of interesting things in Otoyo town. One of this is that there is the oldest cedar of Japan in Otoyo town. According to the Web site of Otoyo town, this big cedar is in the Yasaka shrine. It is estimated to be over 3000 years old and is said to have been planted by Susano-Omikoto, a mythological figure mentioned in old texts. It includes South-Big cedar and North big cedar, and also called Meoto cedar because two roots have been united in the ground. South big cedar’s root is about 20 meters and height is about 60 meters. North one’s root is about 16.5 meters and height is about 57 meters. It was specified a protected plant in 1952. The reason that this old tree has been living for such a long time is people have been taking care of it carefully. “The inside of the cedar is hollow,” one local person explained to me, “so it is reinforced by sheet copper. Moreover, it had been damaged by typhoons or thunder in the past. Therefore, it has been wrapped a rope to prevent it from toppling over”. Thanks to these cares by people, the big old cedar is still living now. “At the most, 300 people come to see the big cedar per a day, for example Golden Week, summer vacation, and so on. When visitors reached the peak in the past, 1116 people came to see it in a day. Also, at least, 30 people come to see it per a day. There is no day when less than 10 tourists come”. It was surprising that the number of tourists was very large. How great the history in Otoyo town and the influence of famous singer are! “These bookmark are made in branches which were broken by lightning”, she continued, “people cannot cut the big cedar due to a protected plant, but they can use broken branches”. It is an impressing point that they are making use of such a gift from nature efficiently. Also calendars of Misora Hibari are sold, but “we can buy them everywhere in Japan because Misora Hibari was a very famous singer, so not just in Otoyo town”, she added. And Ohsugi rice crackers were been selling, but she said “to tell the truth, those were made in Kagawa”. Vistor’s impressions of Otoyo town before visiting and after visiting were different. Before visiting, there might be impressions that Otoyo town is far from Kochi city, very rural, a thinly populated village, just something like negative things. Surely, these things may be facts, but there are also plenty of good points in Otoyo town. For instance, there are a lot of gifts which were given by great nature and histories. There is no more older cedar than one in Otoyo town. For a very long time, people have protected it, and attracted a lot of visitors; it’s the pride of Otoyo town. Also, Otoyo town has some relations to Hisora Hibari. Otoyo town is the place where made her life changed and the starting point of her activity as a singer, isn’t it? These facts are connected with revitalization of Otoyo town. Therefore people should take over and protect these histories. Wow, what an excellent cedar! Hisora Hibari is so lucky!! An interesting article, Chisa. I have been to the tree as well. I really like the rock that you step on to hear Hisora Hibari sing. A very nice area of Kochi.